This is a nicely done conversion set that puts a real interior into the pretty empty cockpits of the Revell kit. It consists of a floor, two sidewalls, control sticks, instrument panels, right and left rudder rails, and two seats. As you can see, the USPS was not kind with my set and one of the seats is badly broken. I did attempt to fix it after I took the photo, but it is pretty much a lost cause. The set comes with a very concise set of instructions showing, with lots of nice pictures, just what you need to do and how it is all aligned. Note that the two seats are different so when using the set, be sure not to get them confused. Note that one has a taller back than the other. Starfighter recommends the Yahu #7270 instrument panels for this set. 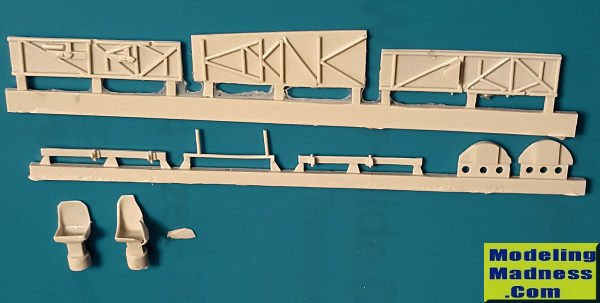 It is a most welcome addition to the lineup of detail parts for older kits that Starfighter has produced and is well worth picking up. 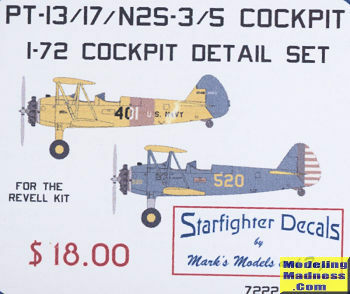 Thanks to www.starfighter-decals.com for the review sample. Get yours direct from the link. If you buy it, it will only encourage them to do more!